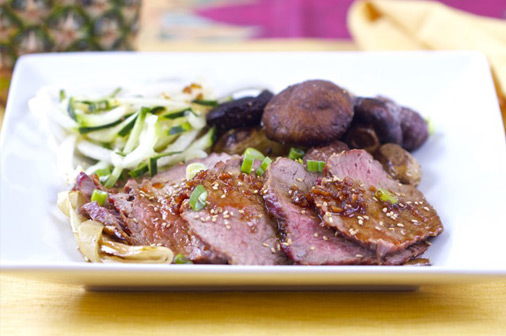 A grilled Tri-Tip that is bursting with tropical flavor. Tri-tip can be intimidating to barbecue as it can turn out very tough. The Island Grillstone™ makes it easy to barbecue a tender Tri-Tip, as none of the flavors or juices can fall through the grill grates. Place the tri-tip in a ziploc bag. Pour the marinade on top and let the tri-tip marinate overnight. Place mesquite wood in the grill and then place the Island GrillStone on top of a rack. Preheat the grill to 350 F.
Place the potatoes, mushrooms and garlic in a big bowl. Drizzle olive oil over the vegetables. Season with garlic salt, parsley and freshly ground pepper. Prepare a bed of onions on the Island Grillstone for the tri-tip. Place the trip tip over the onions. Place the potatoes, garlic and mushroom on the Island grill stone. Cover and let everything cook until it reaches an internal temperature of 145 F.
Slice the tri-tip across the grain and serve it with the vegetables.